When Dennis Hastert was indicted for trying to cover up some $3.5 million in hush money payments to a man he’d allegedly sexually abused decades ago, Washington was shocked. I wasn’t. 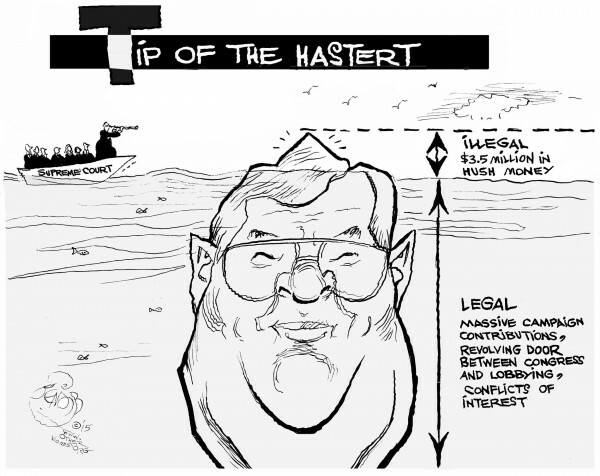 I was shocked that Hastert, who’d spent the better part of his life in public service after working as a high school teacher and wrestling coach, could afford to contemplate a $3.5 million payout. Then I learned that the former Republican House speaker had turned into a lobbyist once he left Congress, and it all became clear. For a big-time lobbyist with low friends in high places, $3.5 million is no big deal. Multi-billion-dollar companies rush to stuff the pockets of former legislators with cash. And lawmakers who are in Congress welcome their lobbyist former colleagues. That’s not merely because they get campaign funds, but also because they hope that they too will get cushy lobbying jobs when they leave office. It’s called democracy, folks. Ain’t it wonderful? Actually, not so much. I can hardly believe that our Founding Fathers wanted their experiment in self-governance to spawn a highest-bidder-take-all bazaar. This hiring of former members of Congress as bagmen isn’t an exclusively Republican phenomenon. It’s the name of the game. When Tom Daschle, a liberal Senate majority leader, was defeated in 2004, he immediately set up shop in a high-powered lobbying firm for a reported $2 million salary. Former Republican Majority Leader Bob Dole led the South Dakota Democrat to the firm. Then there are the Clintons, whom Hillary famously said were “dead broke” when Bill left office. So Bill hit the lecture circuit to put food on the table — sometimes at $500,000 a speech. Now that she’s running for president again, Hillary Clinton has decided she’ll need $2 billion to convince voters of her worth. And people are lining up to give it to her. Republicans, meanwhile, are courting billionaire patrons. Jeb Bush, former first brother, hasn’t officially announced his candidacy yet. This trick allows him to collect money from donors without revealing who they are and without any limits on how much they can give. I realize our government has never been as clean as we’d like to think. In the 19th century, two of our greatest and most powerful senators, Henry Clay and Daniel Webster, were openly on the payrolls of railroads while in office. Railroads did quite well during their tenure, unsurprisingly. The good government movement of 100 years ago was a reaction to the raging corruption of the patronage system that characterized our cities at the time. “Bosses” who ran “machines” for fun and profit handed out contracts, jobs, and public office appointments. It was a rotten system and we’re well rid of it. But I’m not sure that this political auction we’ve got now is much better. Our system is awash in money, all of it aimed at buying power and influence. At least with political patronage people got jobs — and to keep them, they had to get voters to the polls. Our current system discourages voting. That’s the real point of the negative campaigning that’s come to dominate our elections. It isn’t designed to convince you to vote for anyone but to make you so disgusted with your options that you stay home. Even in presidential elections, nearly half of American voters do. Republicans are particularly good at this, by the way. They have to be. After you’ve spent two or more years alienating blacks, Latinos, immigrants, gays, teachers, union members, old people, and women, the only shot you’ve got is to discourage them from voting. That’s why you need all that money. Destroying reputations doesn’t come cheap. In my next life I’m going to be a lobbyist. I’ve spent my life attacking the reputations of the rich and famous for reasons I felt were just and proper, and I have precious little to show for it. If I’d been doing this for the benefit of corporate clients rather than newspaper readers I could move to Easy Street, where I belong.